In continuing with our high temperature polymer series, we will be comparing polyphenyl sulfone and polyphenylene sulfide. Both samples were tested for thermal conductivity and thermal diffusivity using the Hot Disk Transient Plane Source (TPS) 2500 S instrument. This instrument has the capability of measuring absolute bulk and directional thermal conductivity and thermal diffusivity for solids, liquids, pastes and powders without the need for calibration or contacts agents. Thermal conductivity ranges from 0.01 W/m•K to 1800 W/m•K are measurable. Both PPS and PPSU thermoplastics have exceptional stiffness, chemical resistance, high strength, and dimensional stability that is increased further by fiber reinforcement. Applications for these plastics range from medical, automotive, and various engineering disciplines. Properties are very similar for heat capacity and density, however they differ in strength to weight ratio (PPS: 63 to 136 kN-m/kg PPSU: 51 to 82kN-m/kg), and tensile strength (PPS: 85 to 190 MPa PPSU: 70 to 130 MPa). Alongside testing of polyphenyl sulfone and polyphenylene sulfide, other possible polymers to be tested are: fluorinated ethylene propylene, poly(etherether-ketone), polysulfone, polyetherimide, polytetrafluoroethylene, and polyamide-imide. Thermal Property measurements were performed using the convenient Hot Disk TPS single-sided sensor. The TPS single-sided sensor is ideal when only one sample piece is available or when testing large hard to handle samples. Experimental set up is extremely easy, and achieved by placing the material sample on top of the sensor. 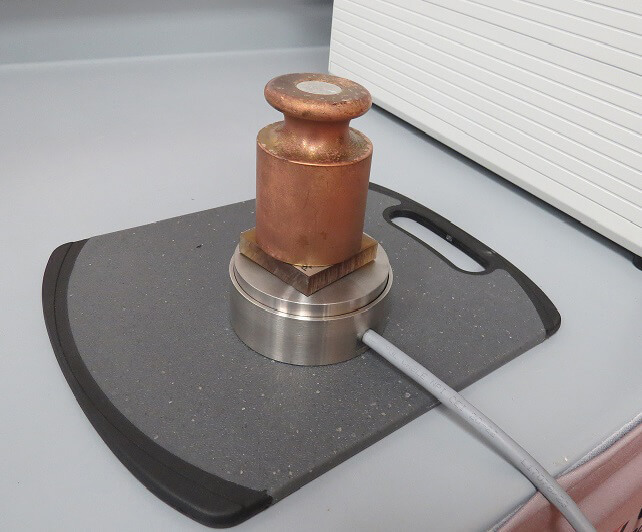 A weight is added on top of the sample to ensure good sensor to sample contact. This unique sensor offers excellent accuracy and repeatability without the requirement of two pieces of sample. The TPS single-sided sensor may also be inverted for larger samples. Figure 1. Polyphenyl sulfone (PPSU) experimental set up. Figure 2. Polyphenylene sulfide (PPS) experimental set up. 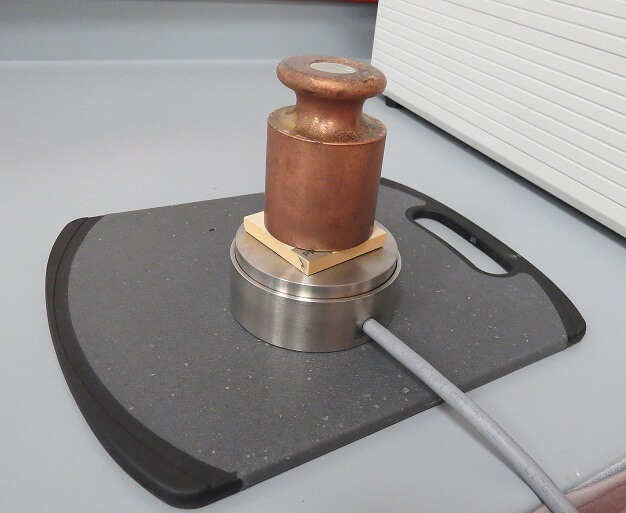 Parameters of test time for both PPSU and PPS: 40 seconds @ 0.1W were selected to ensure representative 3-dimensional heat penetration, without testing beyond any of the dimension boundaries of the sample. This is easily determined, as the Hot Disk TPS measures the thermal diffusivity (mm2/s), thus the penetration depth is calculated and displayed. It is important to make sure the penetration depth from measurement is less the available probing depth, this will result in a clean signal free of any reflections. Once measurement is complete, the contact resistance between sensor and sample may be removed by simply selecting and removing the portion of time which represents the non-linear portion of the temperature vs time curve. This is easily accomplished with the easy to use Hot Disk TPS 7.2.1 Software. After calculations, the testing results of thermal conductivity (W/m•K) and thermal diffusivity (mm2/s) for the sample materials are displayed (See Tables 3 and 4). Table 3. Bulk thermal conductivity and thermal diffusivity for polyphenyl sulfone (PPSU). Table 4. Bulk thermal conductivity and thermal diffusivity for polyphenylene sulfide (PPS).